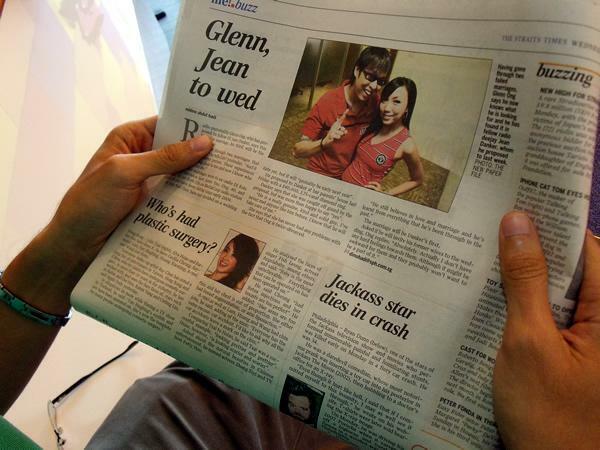 Radio deejay Glenn Ong has proposed to Jean Danker, with the pair expected to tie the knot early next year. The proposal took place on 17 June, with Danker announcing to friends and fans the next morning, "He put a ring on it!" on Twitter, and later on-air during her radio programme. The surprise proposal was planned carefully by Ong. Knowing that Danker was attached to her parents, he chose to propose at her parents' home. He also went to seek Danker's parents approval before asking her hand in marriage. Ong told Channel NewsAsia that he wanted the proposal to be special. "In the end, I just decided I'm going to take the chance and do it the very simple way, which is to share the joy with her parents, because I'd be at her parents' place," said Ong, who went on two bended knees when he proposed to Danker. And the ring that sealed the deal? A S$40,000 1.75-carat diamond ring. Ong had been looking for the right ring for the past one year. The couple have known each other for about 17 years and it will be Ong's third marriage, and Danker's first. Ong's previous marriage with ex-radio deejay Kate Reyes ended in 2003. He then married TV host Jamie Yeo for five years before it ended in 2009. Despite this, Danker believes that it will be different this time round. She told The Straits Times, "He still believes in love and marriage and he's learnt from everything that he's been through in the past."